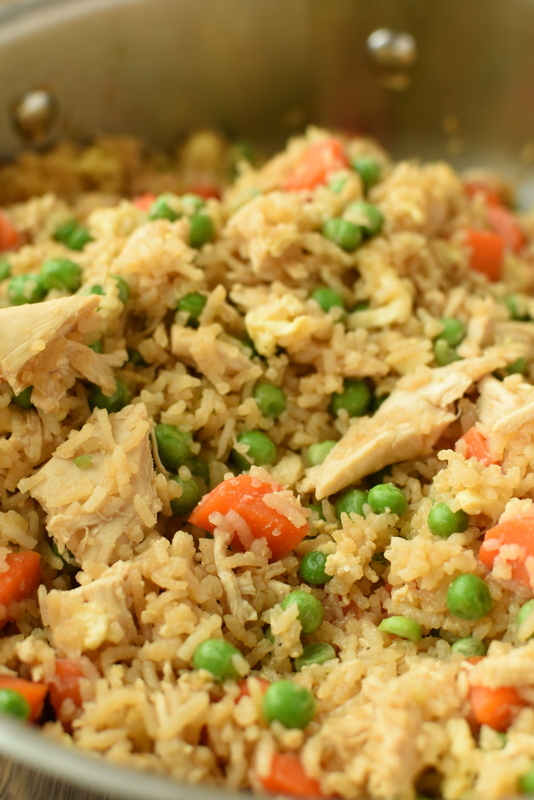 This One Pan Chicken Fried Rice is one of our favorite weeknight meals. 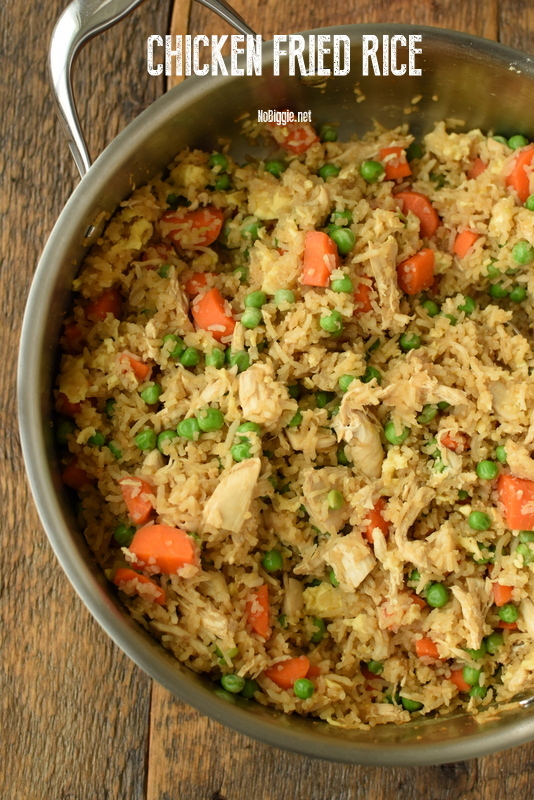 It’s the perfect solution for when you have leftover rice or day old rice. We first shared this recipe a long time ago (hey 2010! ), so we thought it would be fun to share it again with new photos and a video so you can see how quickly it comes together. 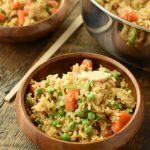 If you’re worried about white rice vs brown rice, you can easily swap brown rice for the white rice, but the truth is there really isn’t that big of a difference. Making this recipe with quinoa would probably be the healthiest option. 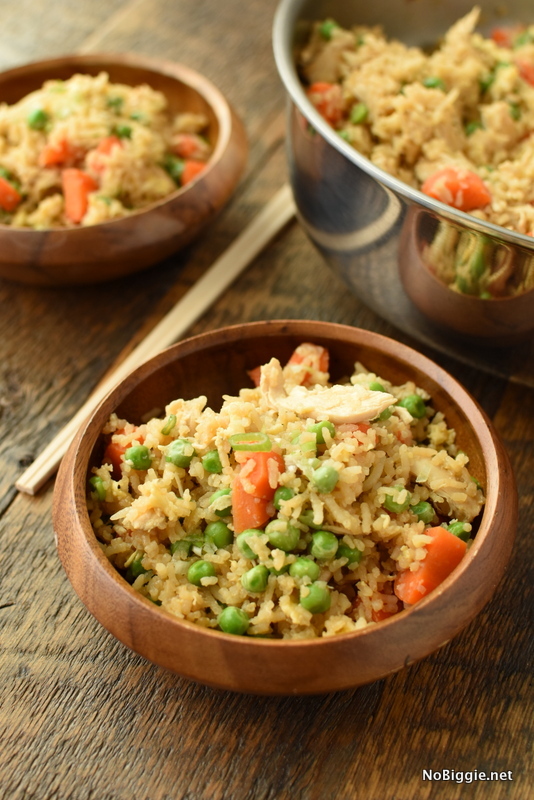 We just like the texture of the white rice better, and it absorbs the soy sauce better. We always rinse rice before steaming or cooking it. Rinsing it helps to remove any debris as well as the surface starch that can cause it to be gummy after it’s cooked. Sometimes I will rinse it twice. In a small bowl pour half of the soy sauce over the chicken to marinate the chicken for a minute. With a hand mixer, blend the eggs and cream together to make full fluffy scrambled eggs. In a large frying pan on medium heat add half the butter and the blended eggs, cook and scramble the eggs. Remove the eggs from the pan and set aside. On medium heat add the carrots and the chicken stock. Simmer carrots until softened. Add in the marinated chicken and the rice, and remaining soy sauce, mixing it all around. Add the remaining butter, garlic and frozen peas. Mix all together well, add more soy sauce if desired, garnish with green onion and Enjoy. You’re going to love this easy recipe, it’s one of our favorites! 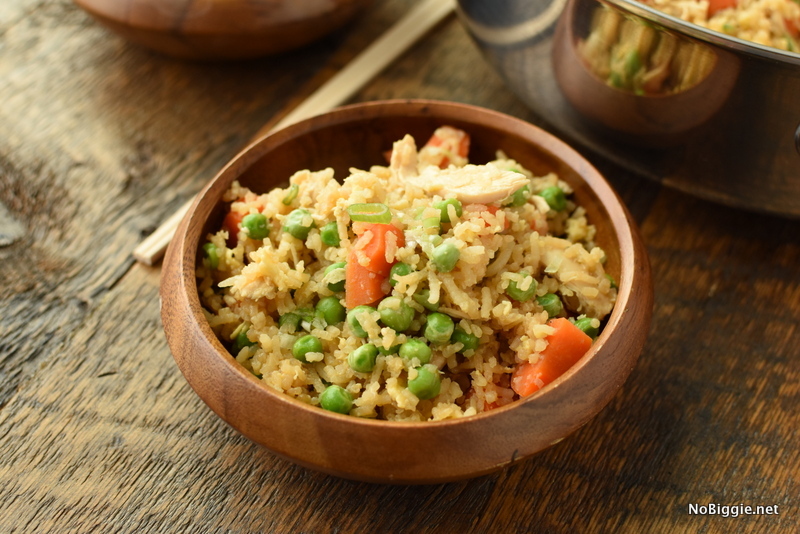 This recipe can easily be made gluten free with a swap for gluten free soy sauce. This sounds delicious! I must try. I love Rotisserie Chicken Week! I bet the kids like that one. Especially Aiden because it has carrots in it. I love this recipe only with ham. I buy ham steaks and cut them into cubes. Yum! Is this recipe calling for 2 cups cooked rice or 2 cups uncooked rice?